This week we headed off to the dentist for our six month check up, something I have done with both kids as soon as they have had teeth. Obviously the early days is only a quick look around as the teeth are popping through left, right and centre! We have been lucky to have a great dental team that are child friendly and have encouraged the kids to practice good oral hygiene and keep an eye on any issues with growth. As well as regular trips to the dentist the kids receive visits from the community dental team that visit the school to discuss and encourage good oral hygiene habits as well as encouraging healthy eating habits. I work in a pre school setting and it is something we do each day with the children, we are part of a healthy smile programme so the children are introduced to healthy eating habits and good brushing techniques with the help of some puppet friends to make it fun and engaging and then brush with us every day. This programme is great for helping to introduce good habits from an early age to help reverse the worrying statistics with children and tooth decay. I was sent some dental products recently from Dentek to review, Dentek are creating fun, appealing products kids will want to use in a bid to help prevent tooth decay in children. The products were great and grabbed the children's attention. The youngest loved the toothbrush cover and the eldest loved being grown up and using the floss sticks like mum and dad, they were perfect size and fruity flavoured to make them more appealing and user friendly for little hands. 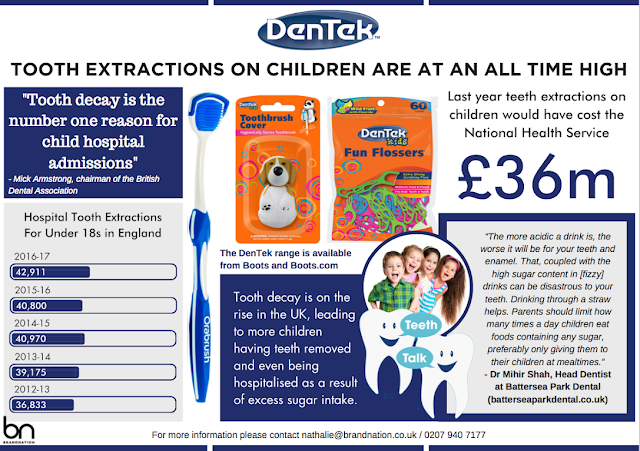 It is so important to teach our children good oral hygiene and work towards preventing tooth decay, part of this is helping to teach them healthy eating habits and the result of high sugar treats on their teeth as well as the effect on their overall health.